Fortunately, the group and its manager discovered two of America’s best songwriters at the beginning of their careers: Jimmy Webb and Laura Nyro, as well as the now legendary producer Bones Howe. There is a fifth dimension beyond those known to man... This is the dimension of imagination. When the 5th Dimension first began its recording career, critics christened the band the black Mamas and the Papas because the two groups shared the same sunny California sound and cheerfully layered male and female vocal harmonies. This was not accidental. The 5th Dimension’s first chart single was a cover of the Mamas and the Papas’ carefree hit, “Go Where You Wanna Go”, which was meant to capitalize on this similarity as the Mamas and Papas were a hugely popular act. Later, the 5th Dimension even employed the same session players that backed up the white hit makers. However, calling the 5th Dimension the black Mamas and the Papas was a left-handed compliment and meant as an insult. It implied the band was lightweight and frivolous, which in 1967 was a heavy offense, especially for a black group. The patronizing condescension of race attitudes at the time implied that one better be relevant or else one was guilty of selling out to the honky establishment. This double standard, it was okay for white artists to be pop but not black acts, hurt the 5th Dimension’s standing in the hip world. Critics at the time did not take the 5th Dimension seriously; unfortunate, because the group did create some excellent music. Collectors’ Choice has just reissued and repackaged the first four 5th Dimension albums on two discs, complete with bonus cuts. The material contained suggests the depth and breadth of vocal talent possessed by the band members. Sometimes the music is truly glorious, but other times it is just okay. That’s because the 5th Dimension did lack one key element possessed by the Mamas and the Papas (personified by John Phillips) a wonderful songwriter and arranger. The 5th Dimension could make good material sound great, but they couldn’t rescue mediocre tunes and ill-conceived production. Fortunately, the group and its management discovered two of America’s best songwriters at the beginning of their careers: Jimmy Webb and Laura Nyro, as well as the now legendary producer Bones Howe. When the 5th Dimension covers Webb and Nyro, the results are magical. The other Webb tunes are well worth hearing, especially the collage-like “Pattern People” and “Rosecrans Blvd.” Davis largely sings the latter song solo in a voice that echoes Sam Cooke in its haunting evocation of a time and a place and a girl. Davis expresses a deep feeling that makes the words seem to mean more than what they actually say. The album also contains two Willie Hutch tunes that epitomize the notion of Golden State soul: “Learning to Fly” and “California My Way” (the new disc contains three bonus tracks of Hutch tunes) as well as the aforementioned Mamas and the Papas song, a jazzy version of folkie Tim Hardin’s romantic “Misty Roses”, and other less notable tracks. 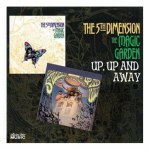 The Magic Garden proved to be the 5th Dimension’s greatest artistic breakthrough. The album contained ten Webb compositions in a song cycle about love -- this album was also released in 1967, the so-called “Summer of Love” -- as well as an earthy rendition of the Beatles’ “Ticket to Ride”. This was the first album Howe produced for the band, and its orchestrations still sound appropriately theatrical. Nick Drake was said to be a fan who tried to recreate its mix of literate lyrics and grand instrumentation on his own efforts. Webb’s deceptively simple and emotionally rich lyrics are well served by the varied voices of the 5th Dimension. They take turns soloing and harmonizing in ways that reveal the layered meanings of the words, augmented by Howe’s creative settings. The record did not sell as well as the previous album; it yielded two minor hits that barely dented the top 40, “Paper Cup” and “Carpet Man”, but that was probably because audiences were unwilling to listen beneath the surface of the tunes. After all, this was the band that put out the fluffy “Up, Up and Away”, but the record is a masterpiece. For example, “Paper Cup” was perceived by most as a soft-psychedelic tune with silly lyrics (“Here inside my paper cup / everything is looking up”) ala Tommy James’ “Crimson and Clover”, but careful listening reveals it's about the downward spiral of an alcoholic (“Life is kind of groovy in the gutter / if you know how / and I do”). Howe’s bright instrumentation and the lively vocals suggest the blithe uncaring of the drunken narrator. The many rewards of The Magic Garden are too numerous to list in a short review, but this album stands as the 5th Dimension’s greatest achievement and still bears repeated listening today. and Valerie Simpson's earliest efforts, "California Soul", but most of the other material is weak, saved only by the 5th Dimension's splendid voices and Howe's imaginative production. The album did go gold, though, largely through the strength of the Nyro compositions. also yielded one other hit, Neil Sedaka's playful "Working on a Groovy Thing". The rest of the album is nothing special, again saved only by the 5th Dimension's splendid voices and Howe's creative production. unable to transcend the material.